It is time to embark on a global odyssey to discover the largest and least explored habitat on earth. 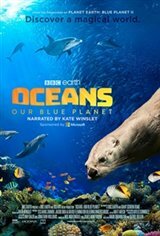 New ocean science and technology has allowed us to go further into the unknown than we ever thought possible.From the coastal shallows to deeper, more mysterious worlds, we reveal the untold stories of the oceans' most astonishing creatures. Dolphins leap for joy through the waves, as we begin our journey into the blue. Our first stop is the coral reefs, where we meet fascinating characters like the ingenious tusk fish that uses a tool to open its food. In the great forests of the sea, we find a cunning octopus who shields herself in an armoury of shells to hide from predators.